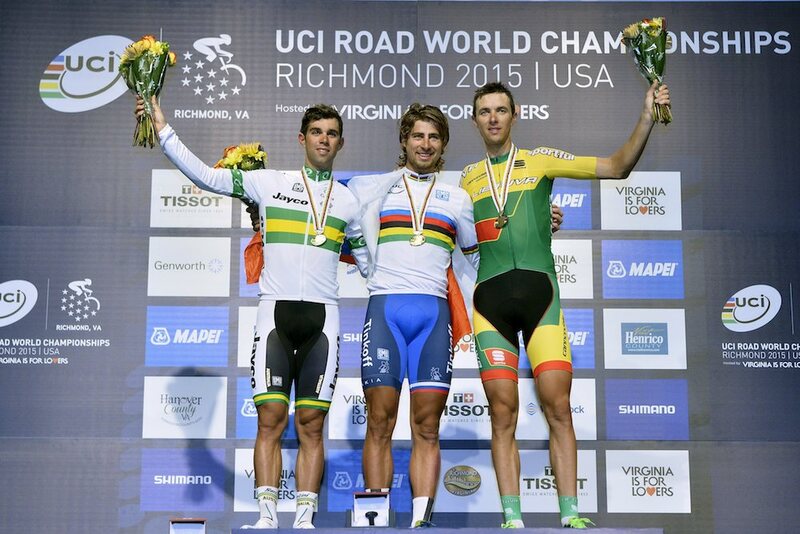 Peter Sagan (Slovakia) delivered a masterclass of attacking riding to take his first World Championship road race victory in Richmond, USA on Sunday, beating Michael Matthews (Australia) and Ramunas Navardauskas (Lithuania) who finished second and third respectively in the following bunch sprint. 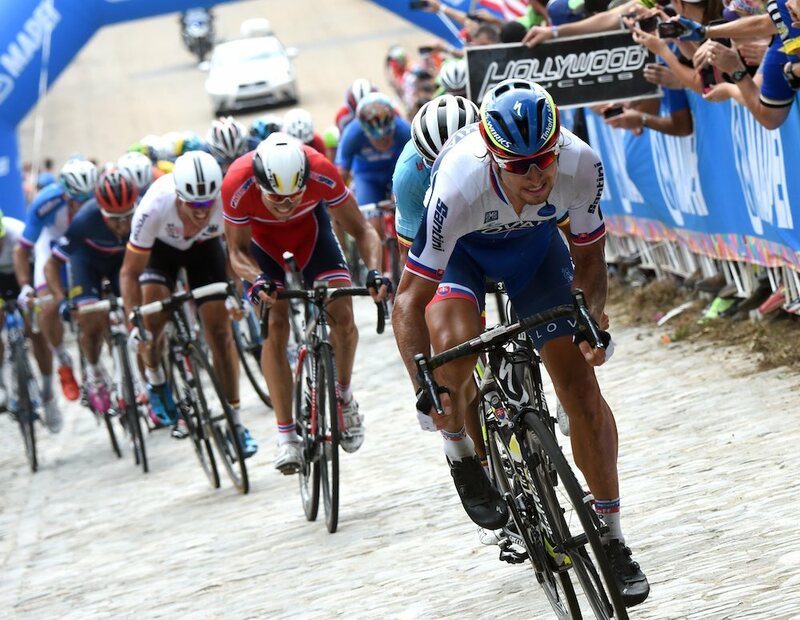 The peloton was together as they approached the first of two cobbled climbs on the final lap of the circa 16km circuit, with Zdenek Stybar (Czech Republic) making the first attack to try and finally break things up to avoid a sprint finish. Pre-race favourite John Degenkolb (Germany) followed, as did Greg van Avermaet (Belgium), but they were unable to put any significant distance between them and the rest of the pack. Everyone was together again as they hit the second climb, with Sagan sitting way down the pack as he launched a ferocious move, surging out front and immediately creating a gap with 3km to go. Van Avermaet made chase along with Edvald Boasson Hagen (Norway), but disorganisation meant they were unable to pull much distance back on the Slovak leader. The pack were quickly closing down on Sagan as he rode up the final climb to the finishing straight, but the 25-year-old dug deep with pain etched across his face, holding on to the gap with enough time to celebrate as he crossed the line. The mammoth race saw a number of breakaway attempts and moves to break things up on the course around the city in Virginia, but the most dangerous was instigated by Britain’s Ian Stannard on the second cobbled climb. Stannard attacked on third to final lap, and was quickly joined by defending champion Michal Kwiatkowski (Poland), Tom Boonen (Belgium), Daniel Moreno (Spain), Elia Viviani (Italy), Bauke Mollema (Netherlands), Andrey Amador (Costa Rica), establishing a 33 second gap. Things began to look worrying for the peloton as no-one appeared to want to take up the chase, but Germany finally took control, though burned off a number of Degenkolb’s key men, but brought things back together with one lap to go. More attacks came immediately as the bunch crossed the finish line for the penultimate time, but no-one was able to get more than an arm’s length away from the pack as the riders geared up for the finale. But no-one was able to do anything about Sagan’s move, and the Tinkoff-Saxo rider has earned himself a year in the coveted rainbow jersey after the biggest win of his career.